There is something about this weather that makes me crave carbs and, specifically pasta. Maybe my body needs the extra fuel to stay warm through the damp chill of late winter. Maybe I have been denying myself pasta since the holidays and my belly just says, “okay, you are being ridiculous; make spaghetti now, please.” Regardless of the impetus, I had to get down to making some sauce and pasta this weekend. As a born-again omnivore and regular gym-goer, I pretty much eat an animal-based protein at every meal except breakfast. It may not be the best course of action, health-wise, but I do try my best to keep my choices on the leaner side whenever possible. Unfortunately, this meal was an exception to the lean meats, as was the previous Bolognese post. Yikes! All I can say is, enjoy a few less healthy meals now, while you can, and hit the gym a little more often. In a couple of months, none of us will be in the mood for heavy pasta and meat dishes. Regarding meatballs, I am a big proponent of mixing meats so that you get a variety of flavors and textures. For this particular recipe, I used ground pork and ground beef, but I often use ground turkey, italian sausage, ground lamb, or ground veal. The rule, I think, is to use at least one bolder flavored meat (like beef, sausage, or lamb) with one that is more mild (like pork, turkey, or veal). From there, the possibilities are endless. Though the meat is your base flavor profile, I also think that good seasoning for meatballs is imperative. I stick to herbs and some parmesan cheese, but you can certainly branch out to more exotic spices (cumin, coriander, fennel) and skip the cheese altogether. The total mixture is generally much like what you would create for a meatloaf, but with less breadcrumbs and, perhaps, fewer seasonings. Think of the ground meat as a canvas and the seasonings as your paints; you can do pretty much anything you want! Evidence of this is an entire article in the January 2010 Bon Appetit devoted to various iterations of meatballs. This is another recipe where I encourage you to cook with your instincts. If you are familiar with ingredients, then you know how they will taste in combination, so go for it. The worst that can happen is a failed round of meatballs and a quick call for takeout. Fear in the kitchen is unacceptable! 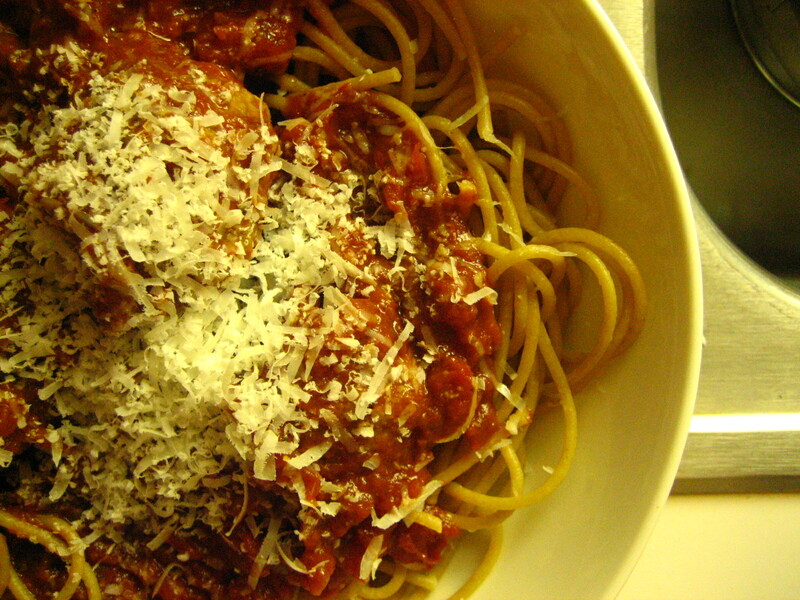 For basic Italian American red sauce, I stick to a pretty simple recipe of tomato, wine, herbs, salt and pepper. Sometimes, the most basic flavors are the most satisfying. Thanks so much! I love the idea of Mexican Meatballs; such a great take on flavor and texture.